Engine 2x370 HP Yanmar d.
In 2008 has been manufactured yacht Swift Trawler 42 called Moja 3. This boat is based in base Sibenik in the area of Sibenik in Croatia. 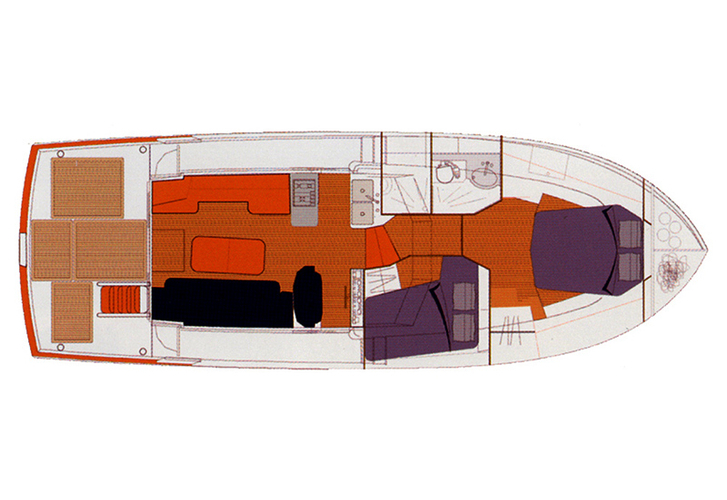 You can accommodate up to 6 pax on the vessel Moja 3. Configuration of beds is 6 (4+2). There are 2 bedrooms situated below sailboat's deck. Moja 3 has 2 WCs. You can get more offers by going to this section: Motorboats Sibenik. Fuel tank is 1500.00 l l. capacious , water container has up to 640.00 l l. In this yacht there is motor 2x370 HP Yanmar d. With 13.50 meters of LOA and 4.17 m of beam Moja 3 offers enough space for comfortable sailing. Swift Trawler 42 Moja 3 is equipped with: Dinghy, Bimini top, Anchor electric windlass, Bed linen & towels, Air conditioning, Radio / cd player, TV, DVD player, Gps plotter, Radar, Outboard engine, generator, Bow thruster. . Security deposit is at the level of 3000.00 EUR. Read about more vessels right here: Motorboats Sibenik.